After a 2010 contest that saw a number of individual country records set around the world, better band conditions may spur even more action in this year's first big contest, the ARRL RTTY Roundup. "When 10 meters fully opens AND enough stations spend time there, this contest is going to be a 24-hour sprint," said Ed Muns W0YK after last year's contest - an observation that could well be spot on in 2012. 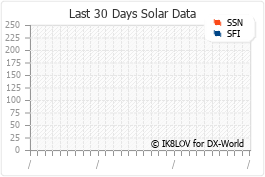 A year ago, sunspots still seemed to be a thing of the past, as the sun was barely active - now in January of 2011, the number of sunspots and the solar flux results are way up, which could produce more action on 10 meters and more questions about strategy. In 2010, the highest 10 meter numbers came from stations in the Carribean as well as out in California - but that could certainly change this year with better conditions like those in the recent CQ WW CW and ARRL 10 Meter contests. A quick check of the band and the DX Cluster as the New Year dawned showed just how open 10 meters remains, with signals from all continents. In past years, the question for serious competitors in the RTTY Roundup was when should you go down to check 15 meters - now it will be when to check 10 meters. For example, last year's US winner in the Multi-Op High Power category was Team N0NI in Iowa - they logged 1858 raw QSO's - just one of them was on 10 meters. Single Op low power champ Don Hill AA5AU made 35 QSO's on 10 meters out of 1908 raw contacts in his log in 2010 - he said then the band was open, but no one was home. "I got excited when I saw the ten meter opening but participation there didn't pan out," Hill said. Maybe this year will be different. AA5AU still owns the Single Op low power world record in this contest, set back in 2006. In the Single Op High Power category, no new mark was set, though Ed W0YK came close last year as he once more had the best high power score in the world from P49X in Aruba - it was his sixth straight victory in this contest, as he won by over 100,000 points. Ed has talked about operating SO3R to have another radio ready on 10 meters - this could be the year that idea gets a real workout. The oldest of the four category records in the ARRL RTTY Roundup is the high power section of Multi-Single, which was set back in 2003 by Team VP5NN, at 243,164 points. You can see all the records by country, continent and overall at the ARRL web site. One thing to remember about this contest is that there is a 24 hour time limit for all stations, even though the contest period lasts for 30 hours. If the high bands are open, then choosing the six hour "off" period might become easier for most stations, who in past years had to find a way to churn out more points from 40 and even 80 meters. Unlike the 2010 test, there is no conflict this weekend with the North American QSO Party - NAQP CW is the weekend of January 14, while the NAQP SSB test is the weekend of January 21. The NAQP RTTY contest takes place the last Saturday in February. The ARRL RTTY Roundup begins at 1800 UTC Saturday January 7 and ends at 2400 UTC Sunday January 8, 2012.